The International Committee of the Red Cross (ICRC) says the situation for ordinary people in Iraq is getting steadily worse. In a new report, the ICRC says the conflict is inflicting immense suffering on the whole population. The plight of civilians is a daily reminder of a long-lasting failure to respect life and dignity, it says. 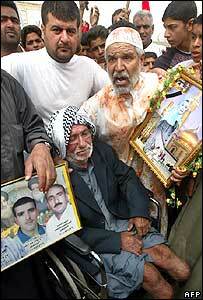 The report seeks to draw attention to what life in Iraq is like, four years after Saddam Hussein was toppled. 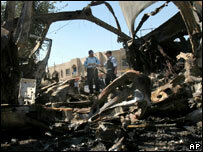 The bombings and abductions in Iraq happen with such deadly frequency these days they hardly make the headlines. With this report, the ICRC hopes to focus on what life has become for ordinary men, women and children. The ICRC still has a presence in Iraq despite the bombing of its Baghdad offices three-and-a-half years ago. Recently Red Cross workers asked Iraqi women about their lives and what might be done to help them. The answer was a shock, according to Pierre Kraehenbuehl, ICRC director of operations. What they would really like is help to “collect the bodies that line the streets in front of our homes every morning and that we find nobody dares to touch or remove,” one woman said. She added the women found it “simply unbearable” to confront their children with them morning after morning as they tried to take them to school. The Red Cross says every aspect of life in Iraq is getting worse. A simple trip to the market has become a matter of life and death. Access to basics like water and electricity are increasingly difficult – so much so that many Iraqis have given up hoping for big improvements and focus on small ones like clearing the bodies from the streets. The famously neutral International Red Cross will not blame anyone in particular for what it calls the current disastrous security situation. But it does say that everyone with political and military influence in Iraq must do more to protect civilians. The report makes it clear is that nobody, not the Iraqi government nor the coalition forces, has done enough so far.